I’ve seen these migration path charts floating around and decided to create one for myself. The idea is to trace where your ancestors were born, but realistically you could use this method in any number of ways. My chart starts with myself as the largest block on the left and works backward through my father (top portion, all Pennsylvania) and my mother (bottom portion, multiple locations). A blank spreadsheet ready to fill in is freely available as a Google doc. Was Your Ancestor a Mason? I’ve found lots of references to various ancestors being masons, but it never dawned on me that lodge the ancestor belonged to may have information on him. A distant cousin suggested this to me and it was like a new door opened. 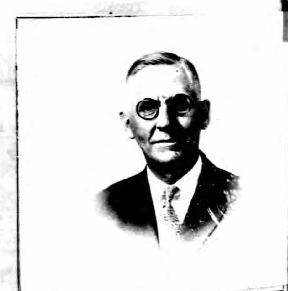 I went back to my records for one particular ancestor—I had found him in google books and other places as being a member of a particular lodge. I was pleasantly surprised to find this lodge still exists and sent off an email. I heard back quickly, although the research took a bit of time. They weren’t able to produce a photo (which the may have for those higher up in the organization, depending on the time period and the lodge’s record keeping), but they were able to tell me the date he joined and the dates he achieved different ranks. It doesn’t seem like a lot of information, but it does place this ancestor in a particular place at particular times, which is nice information to flesh out the experiences of someone’s life. 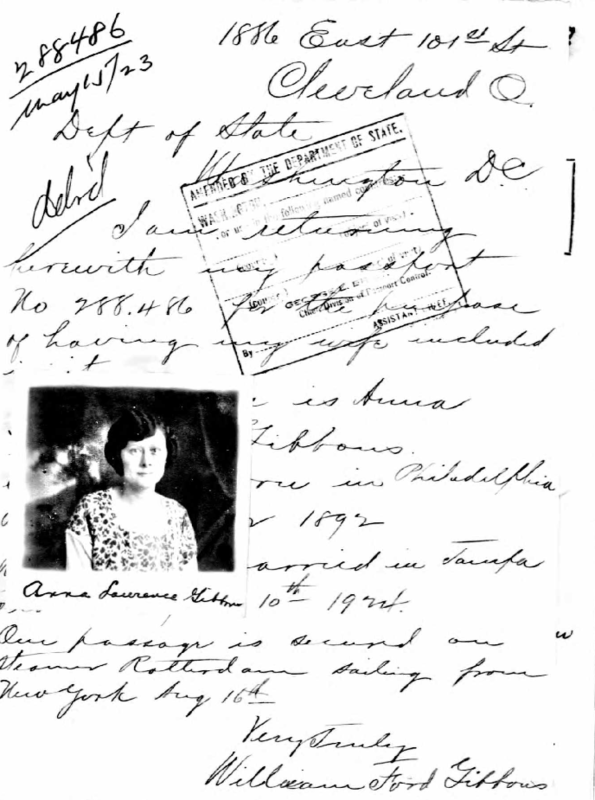 I’ve mentioned my search for ancestor Catherine Ware and her (currently) overgrown burial plot at Mount Moriah Cemetery in Philadelphia a few times here. Each time I visit Mount Moriah I try to visit her plot and learn a little more about the people buried here. 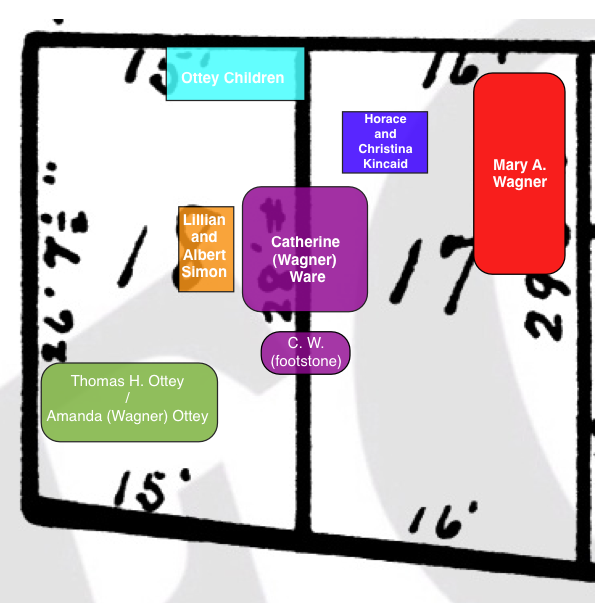 There are 7 visible stone in this plot: 2 for Catherine Ware (a large obelisk and a smaller stone with her initials), 1 for Thomas H. Ottey and Amanda (Wagner) Ottey, one for Mary A. Wagner, one for the children of Thomas and Amanda Ottey that died in infancy or early childhood, 1 for Lillian and Albert Simon, and 1 for Horace and Christina Kincaid. I’m still unravelling exactly who all of the people are and I’ve recently learned from GSP records that there are others buried here, too: John Wagner, Adam Wagner, Rebecca Wagner, and Walter Walker. My diagram started by taking a close up screen shot of the double plot owned by Catherine Ware. I plugged this in to Pages, but you could easily use Word or any other program that allows you to import an image and then place text and shapes over top. I then used the shape tool to approximate the location, placement, and general shape of each visible stone. This is certainly not to scale, but you get the idea. I ended by labeling each shape with text indicating the names on the stones. If I’m able to discover any new stones I can easily edit my document to add new shapes. There is clearly a lot of unused space in these plots! In about a week I’ll be clearing the knotweed to get a better look.